Our top 5 budgeting tips for you! Ask your family what presents they received last year. If they don’t even remember, you may want to check what gift they’d like this year. They may have everything they need. They may want something money can’t buy (world peace anyone?). So, perhaps it’s time to not exchange presents but something immaterial like time with each other. Set a budget. Each year, it seems like we need to top last year’s festive season and put on an even more lavish feast, be lusher or wear more luxurious clothes and accessories. But who are fooling by pretending we got more than we actually have? To avoid falling into debt, create a budget for your expenses. This can include food and drinks, entertaining if you’re having a party. Similar to meal planning, we recommend planning your festive menu and check out the specials in your supermarket. 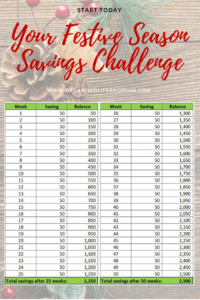 This may help you to save some more. Travelling can be quite a cost. Are you going home for the holidays? Ideally, you’d have booked your flight now to avail a cheaper fare. If you’re staying here, will you require a taxi to get to and from different events? You may want to set a spending limit for each person who you’ll gift. For years, my family has set our limit to 30 EUR (AED 130, USD 35) per person and you’d be surprised how well it’s been working! Also consider items like wrapping utensils, cards and postage. If you take family pictures at Christmas, include these costs, too. Will you go to any functions like the business club’s annual holiday party? What’s the entrance fee and do you need a new outfit, if you can’t wear what you already own? Finally, don’t forget the obvious expenses like decoration for the house. What can you use from last year, like your forever tree and ornaments or will you go minimalistic this year? Reduce the number of gifts. This year, you may only give presents to your immediate family. Announce this change soon and instead of having a big gifting with all your nieces and nephews, invite them over for a big family meal together. You could even ask them to bring a dish and make it a potluck meal. As for friends, I don’t give any presents anymore and don’t expect any either. End of story. It seems like this year offices and business associations are participating in Secret Santa. Here, you generally buy a present for a certain value and give it anonymously to one person. In return, you get a gift from another “secret” giver or Santa. I’m not a big fan of these compulsory gift exchanges and have been drawn into 3 this season. Sometimes, you can recycle these gifts for next year’s Secret Santa (oops, did I admit this?!) or donate them afterwards. Give a need, want, wear and read gift. This works very well for families with children. Ask your kids to write a list of what they need and want. Depending on their age, you can even get them to rate each item from “great” to “would be nice”, almost like a mini prioritisation. It’s then in your hands to choose from their list. Knowing their wardrobe, you can easily find which piece of clothing they’ll need. I personally love the idea of also giving a read gift. Reading a book improves children’s concentration and focus, their vocabulary and develops their imagination. This is true whether they read themselves or you read out loud to them. How fantastic is that as a gift! Use time together vouchers. This can be used for your family and friends alike. You can create your own little vouchers to barter your time for something they may not like, are struggling with or simply appreciate. Think of offering to baby-sit your friend’s kid while she and her husband are going on a date night. You can help your elderly parents in the autumn with their gardening work. Another idea is to house sit while your friends are away. 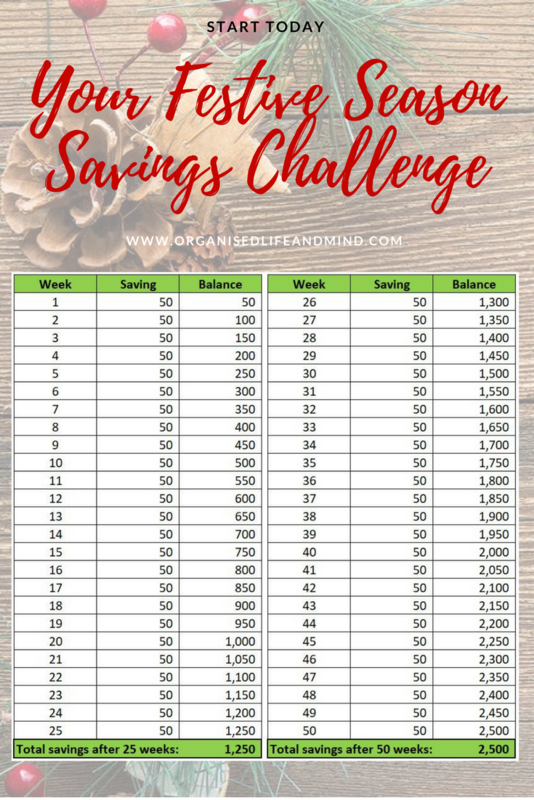 Start saving early. Fair enough, budgeting for this festive season may have slipped your mind. For 2018, however, put some money aside every month. Saving for the bits in your budget becomes a lot easier than when you have to pay everything in one month. What budgeting tips do you have for the members of the Organised Life and Mind community? It’d be so exciting to read the tips of everyone and help each other save some money, time and energy choosing gifts! Should you have a decluttering marathon?